The Temporary Foreign Workers (TFW) program has become such a mess that its complete elimination for low-skilled occupations is now an active possibility. Business, for its part, is screaming bloody murder that the cancellation will force the shutdown of entire sectors. They claim even offering $100/hour or $180,000/year to serve coffee at Tim Hortons will be inadequate to attract applicants. To boot, there is clear evidence that hiring TFWs instead of, say, Canadian youth is bad for Canadians looking for work. As a progressive, I’ve wrestled with what to do with this mess. Should the whole program just be cancelled? If so, what happens to the actual Temporary Foreign Workers and, as a progressive, should I even care? The program has become so large that in several provinces, TFWs have captured large portions of all new jobs created. In the Atlantic provinces of Nova Scotia and PEI, roughly 1 out of every 5 jobs created since 2005 has gone to a temporary foreign worker. The situation is even worse in Alberta, where 1 out of every 4 new jobs created in that province since 2005 have gone to a TFW. Across the country, it’s closer to 1 in 10 new jobs since 2005. However, even this lower national average is staggering when unemployment is stuck around 7%, with youth unemployment double that. if they complain to a labour board…they are deported. The threat of being deported is a much more potent threat than simply being fired, which is generally the threat for low skilled workers. So it’s no surprise that employers prefer TFWs… they complain less about basic working rights…under threat of deportation. The TFW program has the worst imbalance of power in any labour relationship in Canada, whereby no matter who is at fault it is always the worker who suffers. As a progressive, this mockery of worker rights in Canada is disturbing, particularly since it’s taking advantage of desperate workers from abroad who have no rights. And it is low skilled Canadians who experience higher unemployment as a result. Because of highly publicized abuse of the program in the Atlantic provinces and Alberta, public opinion has clearly turned against the program. So as a progressive, what’s to be done? Cancel the program and deport every single temporary foreign worker? I believe there is a middle ground. Let’s cancel the TFW program, but before we do that, let’s offer all temporary foreign workers an expedited process towards permanent residency, if they want it. In the meantime, TFWs should be given a choice to stay at their present employer or find a new one if they wish. (Live-in caregivers, one of the TFW categories, already have the right to apply for permanent residency. Although, there is discussion that this right should be removed as it might back up the immigration system). Interestingly, it is a union that spearheaded this approach on a small scale. The Canadian government should expand it on a large scale. If you were an employer who treated their foreign workers fairly, then good for you as those folks will likely stick with you. However, if you’re an employer who used the threat of deportation to deny foreign workers basic rights and fair pay, then welcome to the Canadian labour market where if you treat people badly … they quit because they can…without deportation.
? Later Retirement: A Win-Win Solution?
? My advice to young workers? Get angry. Hi David – your first chart actually seems to be TFWs admitted via a Labour Market Opinion, rather than all TFWs. I believe those admitted through the LMO process account for only about 1/3 of the total. 2. Canadian Immigration TFW work permits which I did not use. In part its because of the dramatic change in reporting between previous years and this year. I will work at Tim Hortons for $100 an hour. Please contact me. The problem is complex, and does not lend itself to a simple solution. While I appreciate the thought process here, and it is on the right track, the reality is the TFW arrives to Canada, seeking a better life. Once residency is approved, why would a TFW remain at a low paying job? As youngsters, my generation typically began in the “low paying sectors” now filled by TFW’s, such as retail/tourism, babysitting, and farmwork(remembering picking fruit for much less than min wage?). 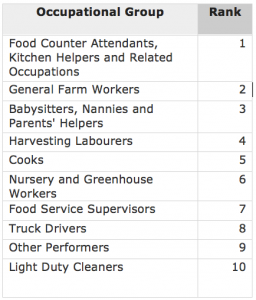 After developing a work ethic in those industries, most of us moved on to better paying jobs. It will be no different for the TFW after residency is obtained. Either by furthering their education, or pure ambition, they will likely strive for a higher paying job. Perhaps the real problem is not the TFW, but Canadian parents/culture. Why is it that Quebec has a very limited TFW population? Keep up the discussion, and maybe we can get this program right for Canada.